I felt it was an appropriate time to start our first winter storm thread of the season. 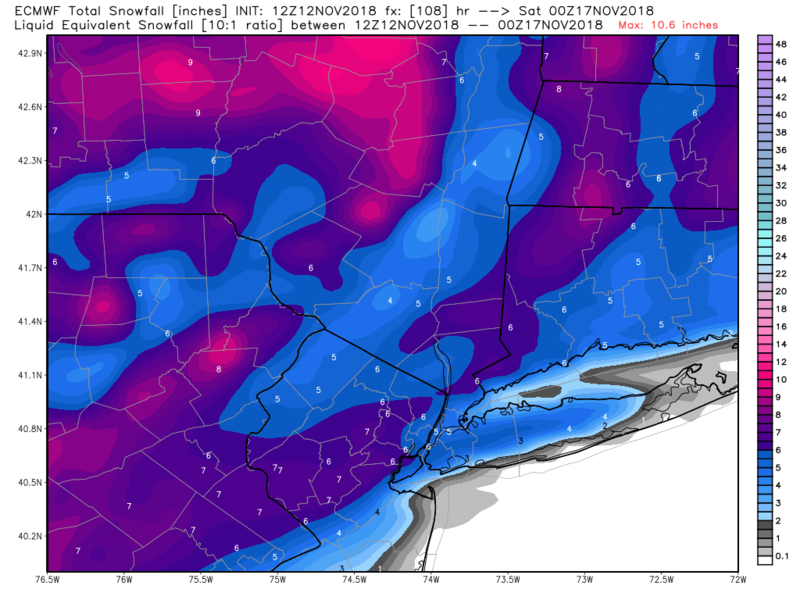 Granted this will not be a significant winter storm, but it looks exceedingly likely areas N&W of NYC will see their first snow and ice of the season. This is a solid 12+ hours of wintry precipitation for some places. A strong 1030mb High Pressure is anchored over Maine which is keeping low level cold in place over parts of our area Thursday. It will be interesting to see if models trend colder or warmer over the coming days. It will depend on where that High is exactly. Really excited about this upcoming winter. Got down to 24 last night and starting to get that "snow is almost here" feel up here. I wouldn't be surprised by 1 or 2 inches here Thursday night. I think there will be enough cold air locked in to achieve that before a changeover to rain. I guess I have to finish raking the leaves. EURO came in colder/faster. 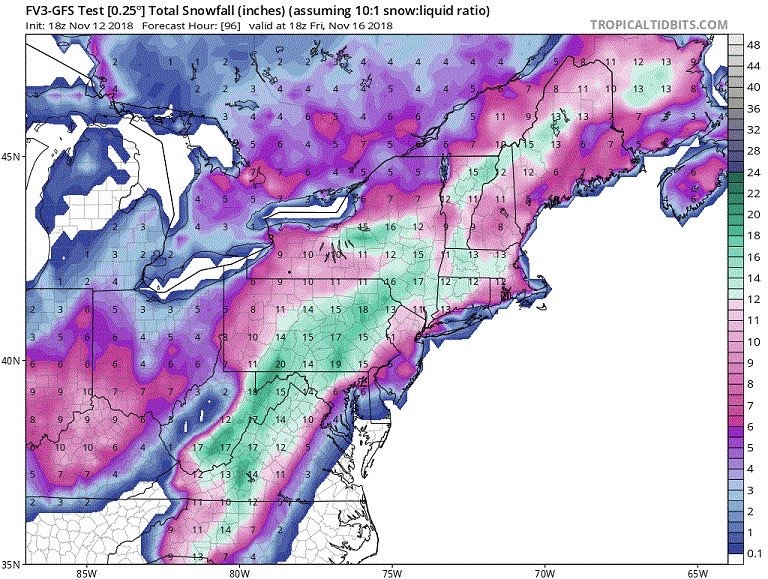 Late week storm just got interesting folks. Not sure I am buying that drastic cutoff from 6 inches of snow to zero snow within the span of maybe five or so miles? Does this include sleet/freezing rain as part of the totals? 18Z GFS is colder FWIW. NWS Albany talking about possible accumulating snow here late thursday and thursday night and may need winter weather headlines. Right now there is still a split between NAM and GFS with GFS colder with more snow and sleet for north jersey/nyc metro. My guess is that we will see some frozen precip from this system, but I doubt we’ll see much accumulation (other than maybe a coating on some colder surfaces), except in the Poconos, upper Hudson Val and maybe extreme NW NJ. Madonne...this is quite the look at 500mb. A closed off 500mb uppper level low over Kentucky Thursday afternoon and moving North-northeast right into the cold air mass that's there from the High. 0z NAM is running. We’ll see how it looks. We’re only 72 hours out, but the models might get a better read on Thursday after tonight’s storm clears out tomorrow. I guess I have been aweful busy, those snow maps are crazy! 6+ even in southern WC? I dunno if I buy that but I will take our first delay or snow day lol, Interesting of course favors the interior but you never know, as you guys have noted it appears its trending colder. billg315 wrote: 0z NAM is running. We’ll see how it looks. We’re only 72 hours out, but the models might get a better read on Thursday after tonight’s storm clears out tomorrow. Any chance I see any sig snow out of this? I work in white plains now and am not looking forward to a friday morning commute in the snow, it always is colder up near 287. But what about down here? Those snow maps show pretty high snowfall even to the coast IF they are taken verbatim. Note the 12z Euro has a ton of freezing rain over a huge area encompassing the area and most of PA with as much as 1" of ice! It certainly seems to me that it will be cold enough aloft to support snow across much of the area Thursday evening. I guess my questions are, when will the transition from rain t snow take place and how much will stick. It is getting dark early now and the sun angle is approaching it’s weakest period so that helps. Sun angle is a non issue now. I'm actually starting to think several inches could fall across interior portions of NJ, NEPA and SNY. NYC and coast is uncertain still. 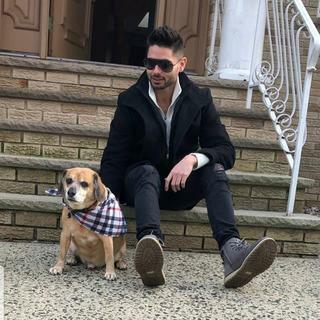 Hey Al, this is your season : ) What do you think for us down here? 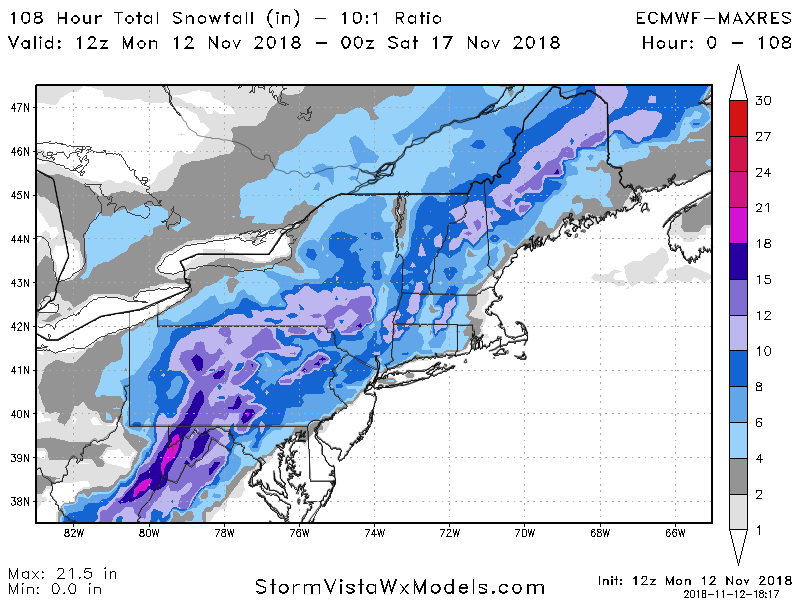 Models show accumulating snow even down to the coast but the amounts being shown especially on the para GFS and Euro last night are crazy for mid november. 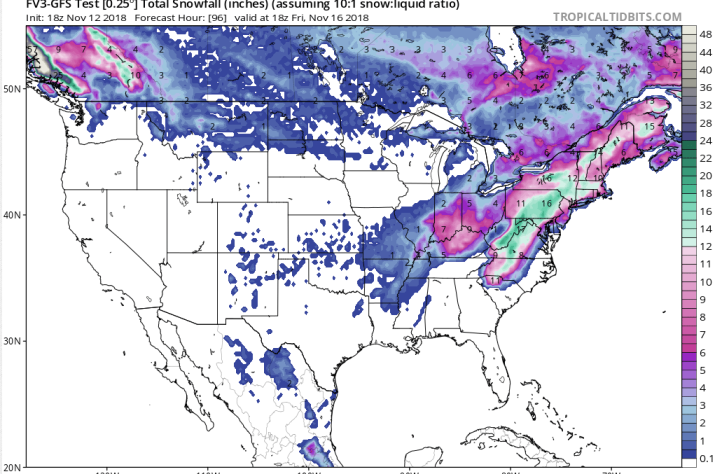 NAM raining thursday afternoon but heavy snow fel lto our south a foot in carolinas lol, they would literally crumble. Hr 81 NAM has 4-8 areawide, except LI. the higest N/W of NYC by about 20 miles or so. Al shows us getting 3-6! NAm trended much colder and south than the 18z.